The temple and healing center of the god Asclepius was located about 550 yards [500 m.] north of the theater. 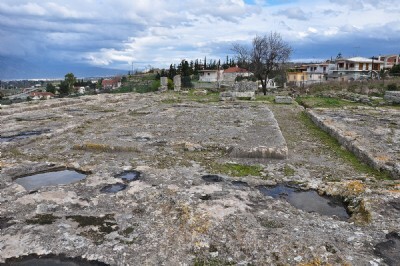 Although not as well preserved as those found at Epidaurus or Pergamum, still the foundational remains of the structure at Corinth are significant. The Asclepion is a place where people came to be healed of their diseases. The complex included dining rooms, bathing facilities, dormitories, and other structures. For view of various votive offerings (tera cotta body parts) Click Here.